Jerry’s mother was nineteen years old and nine months married when he was born. She had received Grandfather Stoll’s permission for the wedding because she agreed to help out on the farm the following year. However, with Jerry on the way, those plans failed. Jerry recounts his first two years of school in the Amish community of Aylmer, Ontario and his parents’ decision to move to Honduras. Life in that beautiful Central American country is seen through an Amish boy’s eyes—and then the dark days when the community failed and the family returned to America, much to young Jerry’s regret. Jerry also tells of his struggle as a stutterer and his eventual conversion to Christ and the reasons for his departure from the childhood faith he knew. 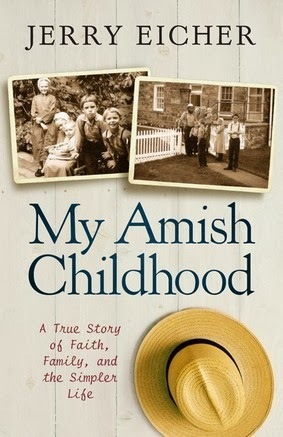 Here is a must-read for not just Jerry’s fiction fans, but also for readers curious about Amish life. This book is a Memoir of Jerry Eichler's boyhood growing up Amish, but not in the typical sense of the word. This description of this book is not the full story about Jerry Eichler's life of growing up Amish. It's 'growing up Amish' in Honduras from about the third grade until a little after he graduates, which for the Amish is in the eighth grade, about age 14. Some families in the Pennsylvanian Amish community in the early 1960's decided to move to Honduras to escape some of the stricter rules of the Amish community here, not to go on a mission trip to help the Hondurans. Don't get me wrong, they still did everything Amish, and also to the amazement of the people who lived in Honduras, too. It was still farming, living, dressing, going to church and everything else Amish, just in a different country. I do feel they did have much more freedom in Honduras, especially if you were a young boy. They had the freedom to roam through the foothills of the mountains and had a great time and saw some amazing scenery. They also had more freedom making income and using machinery to help them farm because of where they lived. Honduras held many new learning experiences for the Amish, especially when it came to farming. They tried all kinds of new crops there. They had no horses there, and for good reason. The climate was not good for them, yet the Amish depended upon them. They airlifted some in, but they don't fare so well. The book is interesting in how they had to adapt to the Honduran land, such as learning why the locals built with adobe and the Amish built with wood, but a few years after building those wooden structures, the insects had flattened them. There is a lot to learn about their experience in Honduras if you are interested in it. Jerry's family did make one trip back to the United States while they were living in Honduras, yet while he was here, he yearned to be back in Honduras. Life there was not so easy, though. There was a lot of stealing, people with guns, an unrest occurred, and many other things. The book was interesting. It's not my favorite, but it's good especially if you want to learn more about the Amish living in Honduras. If you are looking for a book about a boy growing up Amish in the United States in the typical sense, then this is not the book for you. This book is more factual, a memoir about his boyhood while in Honduras. I didn't connect with him very well, but I'm a woman. You know that saying - 'boys will be boys'? Perhaps if I were a man I would have connected more? The book was interesting and factual, but didn't do a whole lot for me. I never knew ANY group of Amish went to Honduras, so that was something new I learned. There were a lot of things in the book I never knew about, as it pertained to Honduras. They touched a little on Jerry's reasoning for turning to Christ after some preachers came to the area preaching about needing Christ in your life. He decides that he wants to follow Christ's ways and not the old testament ways. If you love the Amish, give it a try if this sounds appealing! I received this book from Harvest House Publishers through NetGalley in exchange for an honest review. I was paid NO monies for reviewing this book. I am disclosing this information in accordance with the Federal Trade Commission's 16 CFR, Part 255 which changes yearly, I'm told at: http://www.access.gpo.gov/nara/cfr/waisidx_03/16cfr255_03.html Guides Concerning the Use of Endorsements and Testimonials in Advertising.